Discussion in 'Proxmox VE: Installation and configuration' started by mdbraber, Oct 21, 2018. When I'm trying to install Proxmox on a new build (Fujitsu 3644-B motherboard, Intel i3-8100 Coffee Lake, 32GB ECC RAM, C236 chipset, Intel UHD 630 integrated graphics) it's giving me a black screen after the initial GRUB boot loader. I would expect there's some incompatibility with the i915 graphics driver, so I've tried all sorts of combinations with nomodeset, i915.alpha_support=1etc. but to no avail. The debian installer (both the 9.5 one and the upcoming 10.0 one) are giving the same error. But the Ubuntu installer (both 18.05 and 18.10) work fine and boot into full graphics mode. As Proxmox is based on the Ubuntu kernel I had expected that it would boot the same? /SOLVED: This turned out to be a hidden BIOS option that needed to be disabled on the Fujitsu 3644-B motherboard. Go into PCI settings and disable "Above 4G decoding" and it works like expected. Is there anything I can do / check to get the Proxmox installer to work? I could probably work around this w/ using the Ubuntu installer + debootstrap but would rather use the normal Proxmox installer. Any ideas? This turned out to be a hidden BIOS option that needed to be disabled on the Fujitsu 3644-B motherboard. Go into PCI settings and disable "Above 4G decoding" and it works like expected. I also had this issue, and the fix for the Coffee Lake NUC is to turn on the Legacy Boot option in BIOS. same issue for me on new clevo laptop, i'm not able to install proxmox at the moment. 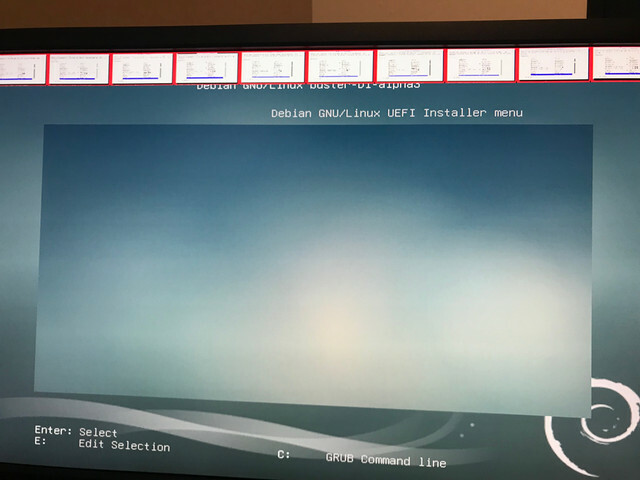 With debian 9.6, the issue is the same. If you have the exact same issue I have check for the "Above 4G decoding" in your BIOS and disable it. If it's "just" a black screen, try and see if another (more recent) kernel might solve your issues. Try e.g. using the Ubunu Live CD or Debian Buster Live CD. This option "Above 4G decoding" is not present in the bios. The bios of clevo laptop is very poor. Ran into this issue with a Gemini Lake (j4105) part but this time it didn't have a legacy boot option to fall back on. The grub2 in Ubuntu 18.10 (Cosmic Cuttlefish) 2.02dfsg1-5ubuntu8 worked so this might be a recent intel graphics issue with grub2. Thanks, I have attempt to install LMDE 3 and it's work for me. I have install proxmox on the top today.